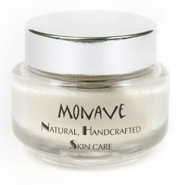 Monave facial moisturizers are delicate, very fresh creams that are handcrafted with superior formulations weekly. 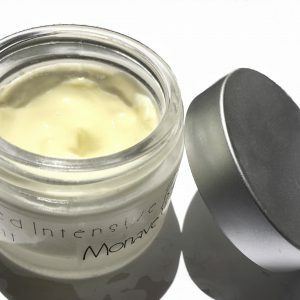 Only cold-pressed oils and butters, floral hydrosols, and essential oils are used, emulsified at very low temperatures so as to retain the healing properties of the botanicals. These creams are 100% gluten-free. Each facial cream is carefully formulated for particular skin types by an aromatherapist who is highly knowledgeable in the uses of essential oils. Ingredients are sourced the world over to offer the highest quality in each product. Please refrigerate any unused portion after six months. …for the past week I’ve been using the moisturizers faithfully morning and night and I can really tell that my skin actually is healing! I didn’t realize that my bumpy skin was being caused by chemical face products…almost all the bumps and redness are gone…I had just chalked it up to old acne scars from high school. Now just smooth skin! I’m soo amazed! I’ve never been great with a skin care routine, but I’m looking forward to ordering full sizes of everything. It’s so relaxing to put on my vegan rose at night…it smells heavenly, and the litsea in the oil control light is such a pick me up in the morning! Thanks again – I will recommend your makeup/skincare to my family and friends.